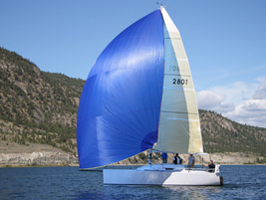 ANDREWS 28: Profile - about the new yachts design manufactured by Sylvana Yachts Inc.
Sylvana Yachts Inc. is proud to introduce to the sailing world a new Alan Andrews design - Andrews 28 - a Sport Cruiser sailboat. In our search for the ideal design for our "dream boat", we selected the Alan Andrews Yacht Design company. Alan is well known for his lifetime achievement in yacht design - the Alan Andrews' signature is unmistakable. We strived with diligence to meet every criteria of his design. We were under the constant pressure and scrutiny to watch every gram of material used in the construction process of this boat. 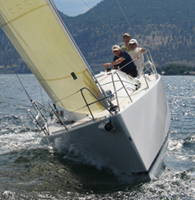 The Andrews 28 consists of a careful balance, without any compromise, between light weight, performance structure of a "Racer" and a comfortable, low maintenance layout of a "Cruiser" interior. The boat hull, deck and every interior part was constructed with the use of light core and was vacuum infused with balance of resin to help us achieve all designer's requirements for a light weight yet rigid design to reach top performance and speed. For this reason, every interior part is structural component of the design and has it's function and a purpose and therefore, cannot be removed or substituted. Although the interior was also chosen with performance in mind, the result is a low-maintenance yet comfortable space with all the amenities required for pleasure cruising - closed head, standing headroom (69.5"), galley, and sleeping quarters. 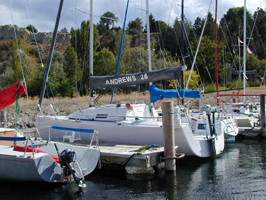 The interior is spacious enough for family to spent few days cruising. Retractable bulb keel allows for easy ramp launching and transportation with an SUV or light truck. Keel box has positive lockable device to keep it securely in down position. 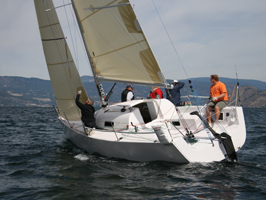 Keel grounding forces are distributed in to the structural frame to absorb the impact. Discussion Forum: Questions & Comments.